There's been a 150-fold rise in the number of London homes listed. Now the home-sharing platform could be branching out. To see just how ever-present the sharing economy has become in many people’s lives, you only need to check George Osborne’s latest Budget. It announced a new tax-free allowance of £1,000 a year for people who rent out their homes through sites such as Airbnb, reflecting just how mainstream the process has become. And London is particularly taken with the home-sharing platform. Some 25,357 homes were listed in the capital on Airbnb at the end of the year – the third-highest number of any city in the world. There’s also been a 150-fold rise in the number of London homes listed on Airbnb over the past five years, according to property group JLL, using data from insideairbnb.com. And with tokens like the tax-free allowance thrown people’s way by the Chancellor, it’s unlikely to abate anytime soon. Unsurprisingly, the most popular reason for listing homes on the site was to create extra income; the second was to fill a vacant home between tenancies, which suggest private rental landlords may be increasingly using the platform. Despite the idea behind Airbnb being for people to rent out their spare rooms, an investigation by the Guardian today suggests that many are using it for a different purpose. The platform is reportedly being dominated by commercial lettings with a growing ‘sub-economy’ made up of ‘dozens of third-party management companies geared up to help hosts maximise their return on vacant properties’. Hoteliers have previously complained about landlords using Airbnb to avoid regulations which protect hotel guests. That reflects some of the struggles of going from a promising start-up to a booming company and dealing with issues which you probably won't have anticipated in the early days. Since being launched in San Francisco (where else?) back in 2008, Airbnb has gone on to secure a valuation of $25.5bn (£17.7bn) and the three co-founders have nothing to squabble about – they each have a net worth of more than $1bn. It's no longer a budding business, but a significant player in the travel industry. This then raises the question of where next? Resolving the growing question over commercial operators on its platform might be next on the horizon, but more generally, is the company looking to diversify to grow the business even more? Uber, another firm frequently cited alongside Airbnb as another hefty disruptor, has made clear its ambitions to become an all-encompassing logistics company – not just a taxi firm. A clue as to where Airbnb sees its future may well be found in CEO Brian Chesky’s disclosure that the company has been testing a service for tourists to book add-on services. So far, these have included meals prepared by personal chefs, bicycle rentals and art gallery tours, according to Bloomberg. The aim to take control of more aspects of their customers’ travel experiences would make sense. 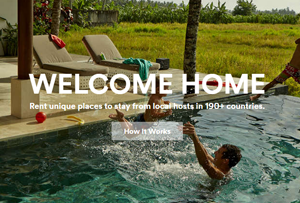 Often when people stay with Airbnb accommodation, they ask the owners for tips on trips and things to do in the area. There’s definitely an opportunity for the company to take here and work towards a more all-incorporating travel experience. Chesky said: ‘When people go to a place, they want much more than just a home. They want to be part of a neighbourhood. And what we are really focused on doing is, how can we immerse you into a neighbourhood?’ It looks like we'll find out soon enough.